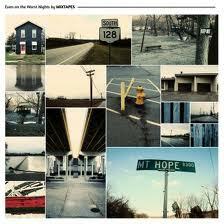 Even on the Worst Nights is not a life-affirming record. In ten years, no one will ask you where you were when Mixtapes released it. Let's say pop-punk bands are like grapes. Fireworks and The Wonder Years matured into fine wine with Gospel and The Upsides. But maybe Mixtapes doesn't want to be a Pinot Noir or a Merlot. Maybe being cool and refreshing grape juice suits them just fine, thank you very much. And really: who doesn't like an ice-cold glass of grape juice in the summer? Maybe this isn't their grown-up album, and maybe they didn't want it to be. The tried-and-true formula of back and forth vocals, toe-tapping acoustic guitar melodies and scorching pace of 16 tracks in just a few clicks under 40 minutes is back. But that's not to say the record is Maps, Part 2. "Russian House DJ" is a slow burner with nifty drum work in the verses, and the lead guitar riff is infectious. Even "Basement Manners" doesn't sound like a usual Mixtapes barnstormer, heavier on the gang vocals and lighter on the harmonies. A cameo from Grath Madden of House Boat on "Anyways," a sonic middle finger salute to critics sugar-coated in the album's catchiest chorus, is a reminder that this is still whole-heartedly a Mixtapes album, albeit crawling with more earworms than past efforts. "I'll Give You a Hint, Yes" is a simple song with a simple, maddeningly sing-along chorus about enjoying the simple things in life. "Just When You Thought it Was Over" blisters through it's three minutes in a blaze of witticisms and shout-along glory. One of the record's calling cards is its realistic and relatable lyrics. Co-lead singers Maura Weaver and Ryan Rockwell didn't pen an album of rah-rah, "I'm not sad anymore" battle cries like The Upsides. There's heartbreak here: especially on "One For the Ozarks," a song about coping with loss gift-wrapped in hand-claps and blink-and-you-miss-them drum fills. "Golden Sometimes," the album's slowest fare, struggles with loss with wistful performances turned from Rockwell and Weaver. Even on the Worst Nights is punch-drunk with nostalgia of good times and even better friends. But there is optimism, and it comes in droves. Mixtapes drown sleepless nights and sad thoughts with bouncy punk melodies and personal lyrics delivered with beaming smiles. Closer "Mt. Hope" features a gritty guest performance from The Wonder Years' Soupy Campbell, and is the closest thing to a rallying cry as Mixtapes has. Even on the Worst Nights isn't the most sophisticated of albums. It's not the kind of record to bring to classy parties to show how refined and immaculate your tastes are. It won't be lauded for stepping out of its comfort zone and being edgy or bold. But that's the charm of Mixtapes: they didn't set out to write an edgy or bold record. And for a band that's stuck with its sound as long as they have, their familiar brand of pop-punk suits them just fine.